According to the terms of the Treaty of Waitangi, the Crown had the monopoly of the purchase of Māori land. However, many Māori considered that they did not receive a full and fair price from their land sales. They felt that they would have received a better price had they been able to sell their land freely. A Native Land Court was established in 1865, but ceased buying Māori land. Instead, those Māori wishing to sell had to appear before the Native Land Court and prove their title to the land. On receiving a Crown title, they could then sell their land freely to whom they pleased. However, very often on receiving land titles the Māori found they could lease their land but not sell it. Here were the different conceptions of land. For the Māori, land was their country and a part of their tribal territory and heritage, not simply a source of food, profit, raised living standards, as the European concept. On the death of the prophet Te Ua Haumene in 1866, founder of the Pai Maarire ("Good and Peaceful") religion, his relatives Te Whiti and Tohu continued with Te Ua Haumene's teachings apart from some slight differences. The Hauhau rituals were not practiced, and the niu (a post resembling a flagpole) was no longer used for ritualistic worship. As with Te Ua Haumene, Te Whiti and Tohu's teachings were mainly drawn from the Old Testament, and peace remained at the core of their teachings. The two prophets held huge monthly meetings, preaching and teaching to crowds of up to 2000. (Te Whiti can also be referred to as "shining", and Tohu means "a sign".) Te Whiti and Tohu were considered by nearly all the Taranaki Māori as symbols of Māori resistance to colonisation. They saw their land rights as quite simply not negotiable with the Europeans. Land was sacred, and Te Whiti and Tohu stated that land which had been confiscated by the Europeans would be returned to the Māori. The Parihaka followers did not consider themselves as the Jews of religion, which Te Ua Haumene had preached, Te Whiti and Tohu taught that the Māori were the "lost sheep of the House of Israel", and "the Chosen People". Peace was the continual and regular basis of their teachings. The Parihaka people were told not to retaliate against the Europeans, so that an eventual war would be avoided. At this time, the whole of the coastal land area of Taranaki had been confiscated. In south Taranaki however, British control covered only the area as far north as the Waingongoro River (Snoring Water). In addition to this, the British wanted the land between the Waitotara River (wai : water; totara : native tree) and Waingongoro Rivers, for settlement. The construction of a road was planned, but this would cut through areas which were occupied by Taranaki Māori. In Parihaka and in most of south Taranaki, Te Whiti and Tohu's word was law. Any dealing with Taranaki tribes would have to be dealt with via Te Whiti or Tohu, and although both prophets were willing to negotiate, both equally insisted this should be done only by a meeting with the Governor himself. Between the 1870's and the 1880's diplomatic negotiations were carried on with the Māori. However, only one Governor actually attempted a meeting with the Taranaki prophets - Sir Arthur Gordon. Gordon disapproved of the way by which land was disappearing from the Māori in favour of the settlers, but local support for his policy was lacking. The Native Minister at the time, John Bryce, wanted to use force to remove the Parihaka prophets in order to proceed with the land surveys. In 1878, the Grey Government acted, by commencing a survey of the Waimate Plains which were to the north of the Waingongoro River. Te Whiti ordered his followers not to attack the surveyors. However, in retaliation for a past wrong, one member of the survey party was killed by a Māori called Hiroki. Hiroki immediately sought refuge with Te Whiti, and when requested by the Europeans, Te Whiti refused to hand Hiroki over for trial. The Parihaka Māori commenced a pacifist resistance to the continuing governmental survey by regularly removing the survey pegs placed by the surveyors. They then began ploughing up unoccupied settlers land in May of 1879. This period became known as "the year of the plough". Although the settlers feared war, the Parihakas remained unarmed. Exasperated, the police started out by arresting the ploughmen, but each time Te Whiti and Tohu send new unarmed ploughman groups to continue. The arrested ploughmen were imprisoned for a number of months, without trial - later to be extended. The aim was to retain the Parihaka activists in prison until the Commission had terminated the area survey. With the main group of activists in prison, the time was now convenient to commence construction of a road extending north from the Waingongoro River, and south from the Stoney River. This, however, involved cutting through Māori fences. The fences which were cut by the Government surveyors were regularly repaired by Te Whiti, Tohu and the Parihaka community, seriously hampering the road construction plans. Losing patience, the Native Minister Bryce, accompanied by 1600 Volunteers and Armed Constabulary members entered Parihaka on 5th November 1881. They met with no resistance. 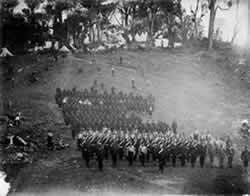 Volunteer soldiers lined up at Parihaka Camp. Photograph taken by William Andrews Collis. Permission of the Alexander Turnbull Library, National Library of New Zealand Te Puna Mätauranga o Aotearoa, must be obtained before any reuse of this image. On being asked whether they would accept the Queen's supremacy, both Te Whiti and Tohu refused. In handcuffs, both were transported to New Plymouth jail. Parihaka was then half destroyed by the troops. Māori from tribes outside of Parihaka were ordered to return to their homes. Te Whiti and Tohu were eventually exiled in the South Island. They unceasingly refused to accept the Government's land terms, but in 1883 were granted permission to return home. Parihaka was rebuilt, and still retained a considerable following in Taranaki. Te Whiti was considered as one of the most charismatic speakers in the history of New Zealand. Parihaka Parihaka International Peace Festival. Also contains historical information about Parihaka. The legacy of Parihaka - from the August 2000 issue of the New Zealand Historic Places Trust magazine. "The legacy of Parihaka" article written by Jenny Bornholdt, freelance writer.